Shouldn’t The Chief Law Librarian Be Fired For Failure To Preserve Irreplaceable Books & Documents? According to the Bajan news media “environmental problems” are responsible for ruining a “substantial” amount of the books and other documents in the law library of the Supreme Court. Typical Barbados news story: “environmental problems” are responsible for this massive loss. God forbid we would ever hold a real person responsible for anything. No, it wasn’t the people in charge of the law library who are responsible for failing to note the deterioration and protect the thousands of books and documents – many of them irreplaceable. No, it wasn’t Chief Justice who is responsible – even though according to his own statement in the Barbados Advocate he has known for at least four years of the deterioration and did nothing to stop it. No, it wasn’t former Attorneys General Mia Mottley or Dale Marshall who are responsible for this loss. It wasn’t 15 years of a BLP government that spent hundreds of millions on cricket and consulting payments while neglecting everything from schools, to police stations to the law library. According to Attorney General Freundel Stuart, nobody in the current or former governments ever thought to train ANY of our law librarians in book preservation or about the dangers of dampness, mould and fungus to our almost 300 year-old law archives. It is like the whole problem just happened last week without any warning. 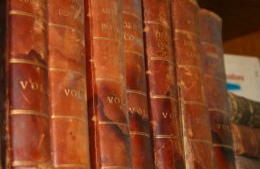 Books are damaged by water and dampness? Well, who could have known! So you see? No person is responsible… it was “environmental problems”. And the solution to the “environmental problems”? The usual: borrow or beg for more money from the Inter-American Development Bank. ENVIRONMENTAL problems, including mould and fungus, have cost Barbados’ highest domestic court a “substantial” amount of its library material. Chief Justice (CJ) Sir David Simmons disclosed yesterday that authorities were now looking to secure funding from the Inter-American Development Bank, as part of its Justice Improvement Programme with the island, to significantly restore the large volume of legal books and other important reading material housed in the 278-year-old Supreme Court library. Both Sir David and Attorney-General Freundel Stuart voiced concern about the impact these environment-related issues could have, with Stuart saying most Caribbean governments had devoted larger budgets to libraries, but had not paid enough attention to training law librarians in book preservation. The officials were speaking yesterday at the Faculty of Law, University of the West Indies, Cave Hill Campus, during the official opening of the Caribbean Association of Law Libraries 24th Annual General Meeting and seminar.